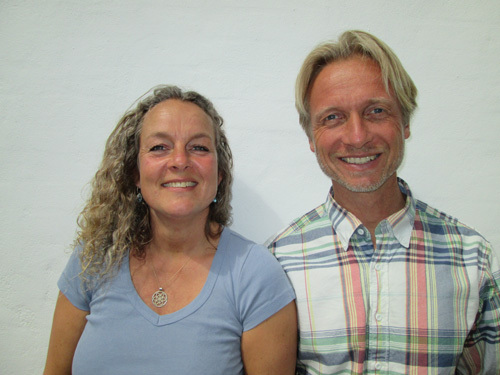 Cecil Rye Olsen and Carsten Bruhn-Henriksen (called Bruhn) both teach at the Centre for Inner Freedom. Since they both (in separate processes) experienced profound shifts in consciousness in 2004 they have facilitated spiritual retreats in Denmark, Germany, Peru, New Zealand, Australia, Philippines, England, Scotland, Wales, Austria and Italy. Following a major crisis in the fall of 2003 the inner guidance took me through a series of very powerful retreats and satsangs, which culminated in a 10-day process, where I received enlightenment on September 6th 2004. Divine Presence completely permeated my being, dissolving me into nothingness…. turning me into everything at the same time. My heart became my home, and in it there is an experience of infinite space, a complete inner freedom and a bubbling undercurrent of love, joy and humor, which is not conditioned by anything at all…. it is always there – also when I am crying. I have no words to describe the intensity of the Presence flowing through my system. Life is full of life, so totally simple and natural because I am now holding on to nothing and holding nothing away :o)) I really want to pass on the gift – I think it is an inbuilt feature in it……. To share the Presence and the experience of the magic of life on this planet. To be able to see the fullness of each moment – right here, right now. I was born in 1969 and live in Centre for Inner Freedom on Samsø with Cecil and Milla – our daughter. As a child I had experiences of non duality but it was not until the twenties that I became focused in my search. I experienced an existential meaninglessness as a continuous undercurrent in my life in spite of having all my worldly goals and wishes fulfilled – in terms of family, place to live, job and hobbies. This undercurrent of meaninglessness was during a period of 6 years both a pain and a driving force towards inner freedom. On March 6th 2004 I was set free (enlightenment) and I cannot find the words to express my gratitude towards all my teachers and this profound universe. I have a long academic education behind me from which it has taken me several years to recover :o) (I studied engineering and business management in university). I am also a licensed bungy jump-, skiing-, and in-line instructor. For me extreme sport was a way of touching the enthralling reality of the now – sometimes resulting in experiences a little too extreme :-). Then I realized that the wildest experiences came when I was sitting quietly on a cushion. I have practised yoga and meditation under guidance from some of the world’s most amazing spiritual teachers. I have connected to numerous other masters through inspiring books and meditations. I have studied and worked with kinesiology and healing and is deeply grateful for all the help I have received. For the last 15 years I have also worked in the business arena as a process facilitator, lecturer and coach for individuals, teams and organizations in European companies. Personal development has been the primary focus. I love working practically in order to achieve insights through direct experiences and dialogues – not through dreary theoretical monologues. In our spiritual retreats and seminars (Actitivities/Calendar), which primarily deals with transpersonal development we use a variety of tools, which have been useful for us in our own processes. In everything I experience a magical flow – guided from inner freedom.